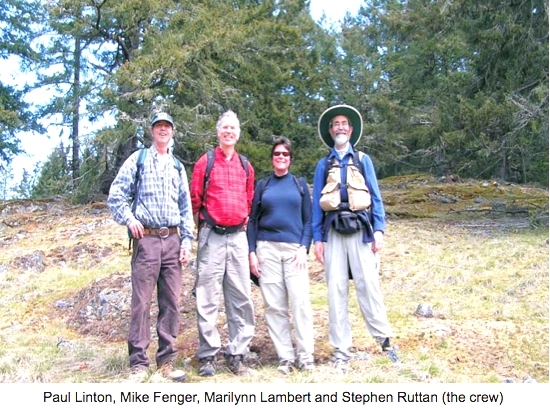 On May 3rd three of the FER Board visited Paul Linton and the Mount Maxwell ER. In 1972, a 65-hectare parcel of land was preserved under the Ecological Reserve Act establish- ing Mount Maxwell Ecological Reserve. 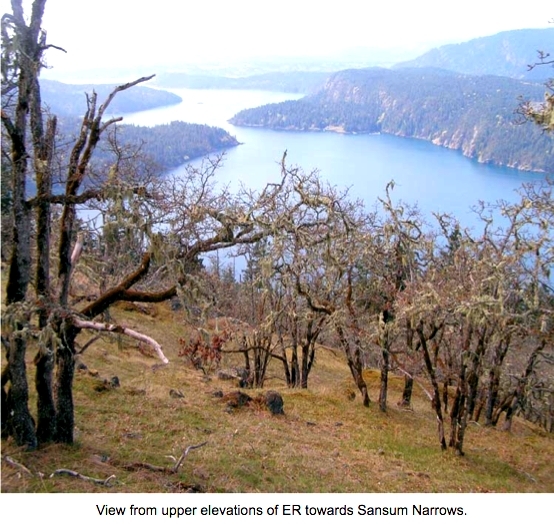 In 2001, The Nature Trust [TNT] acquired 280 hect- ares of land adjacent to Mount Maxwell Ecological Reserve, and leased it to the province. The TNT land and an additional 45 hect-ares of land were added to the ecological reserve in 2004 increasing the size to 390 hectares. Extensive opportunities for research in the ecological reserve have been identified. Prioritizing and scoping financial requirements for implementing manage- ment activities (e.g. undertaking invasive species removal, maintaining Garry oak meadow, eliminating grazing by feral sheep. livestock, and impacts of long term fire suppression) is required. BC Parks has limited re- sources to undertake research and management in this Reserve. BC Parks will seek to identify partnerships to assist in the completion of research and monitoring projects over the next 5-10 years. This might best suit participation by a post- secondary school, working with the Garry Oak Ecosystem Recovery Team and funding organizations. Continue to minimize access: de-commission unsanctioned trails; reroute trails that pass peripherally through the reserve; monitor and enforce- ment along shoreline to control camping in the reserve. Establish clear information for reserve boundaries. 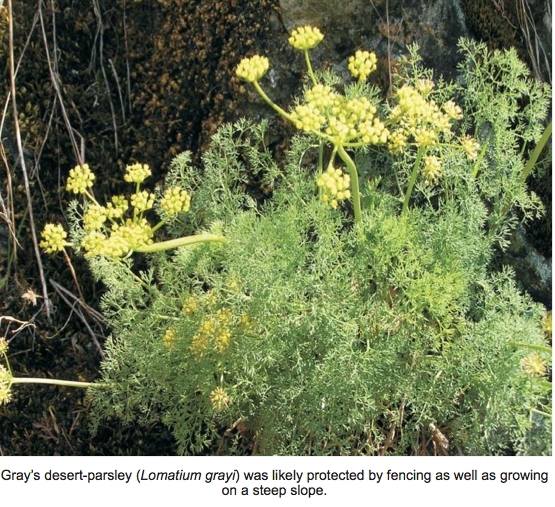 Investigate options for Gray’s desert-parsley (Lomatium grayi) was likely protected by fencing as well as growing on a steep slope. We were met by Paul Linton, the long time ER warden in this reserve. Paul was happy to report that there have been no feral sheep observed in the ER over the last two years. This ends approximately 136 years of sheep grazing from these eco- systems. There are still 26 feral sheep affecting the Mount Tuam ER. Spring was well underway at the lower elevations and the oaks were in leaf in Victoria but not in the upper portions of this ER. 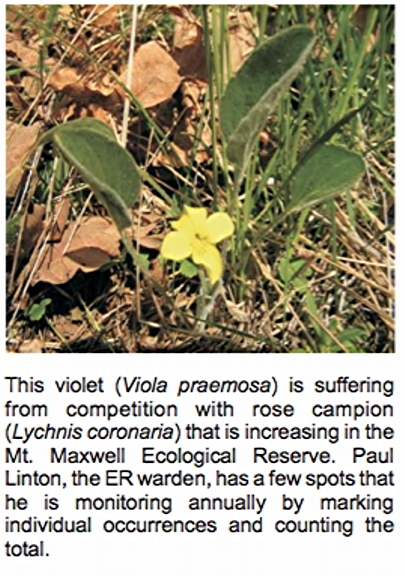 This has been a late spring. There was a considerable amount of paint ball activity at the upper edge of the reserve and evidence on the trees and on the ground. Paul has dis- cussed this with some of the local paint ball enthusiasts with mixed results. We all owe a big thanks to Paul Linton who continues to be the watchdog for this ER as well as MountTuamER. Asthisgoesto press, Paul is heading to Mount Maxwell ER to see if the recent 7 hectare fire has affected the ER.